"Books to Enrich Your Life"
The Bhaktivedanta Book Trust (BBT) was founded in 1972 by His Divine Grace A. C. Bhaktivedanta Swami Prabhupada. Its focus is on publishing classic Vaishnava texts, epics, and contemporary works on the philosophy, theology and culture of bhakti-yoga. The BBT especially emphasizes the works of the Gaudiya-Vaishnava tradition. Krishna.com is partially supported by the BBT, and much of the content on Krishna.com’s family of sites originates in the teachings of Srila Prabhupada, as well as contemporary followers of the bhakti-yoga tradition. All BBT material on the site is used with written permission. For more information on the Bhaktivedanta Book Trust, or to contact the regional offices for information, please visit www.bbt.info. For inquiries into using BBT copyrighted material, please contact the Rights and Permissions office at www.bbti.org. For more information on Srila Prabhupada (His Divine Grace A. C. Bhaktivedanta Swami Prabhupada) visit prabhupada.krishna.com. Read BBT books online and download PDFs of books to read later from our ebooks page. Visit our galleries to browse the collection of BBT paintings--thousands of images compiled from all of the BBT's publications. 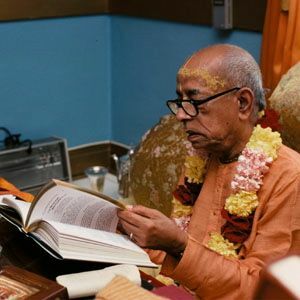 Browse our online store for available BBT books, as well as CDs, DVDs, and other media on bhakti-yoga, Krishna consciousness, and Srila Prabhupada.